The Happy Bull, the name itself is pretty funny. Me and my mom were looking for a nice place for dinner after gym and wanted to try out more places around Crows Next. Instead, we found one at Lane Cove, just off Longueville Road. A tapas restaurant with a very high rating, we were quite excited! It's a basement styled restaurant on Austin Street and as soon as you walk in, the decor makes you feel like you've been transported inside a cowboy movie. They have 3 big tables and one smaller one for two so you may have to share your table with others. The dark wood goes well against the red walls. Along the walls are souvenirs and decorations. The spicy chorizos and sangria. The chorizos were indeed spicy and made me pant for water. The sangria was quite tasty with lots of fresh fruit chunks on top. One 0.5 L jug gives 3 glasses. Spicy and salty. Just the way I like my chorizos! Prawns in spicy tomato sauce. We were contemplating whether to get these or the garlic prawns but my family prefers spicy over anything else. They were only mildly spicy and came out bubbling away in the clay pan. If you resist the urge to gobble it all up after it comes out, you'll see that the sauce reduces to a thick consistency. Dip some bread into it and you have yourself a spicy tomato dip with a hint of garlic! The prawns itself were very juicy and plump. The sauce had that spicy hit with a hint of garlic that really accentuated that deep Spanish flavour. We left this to simmer a bit and coated the prawns with the thick sauce. It was delish! Stuffed peppers with beef. None of the dishes explain exactly what's in the dish so I could only guess what was inside. 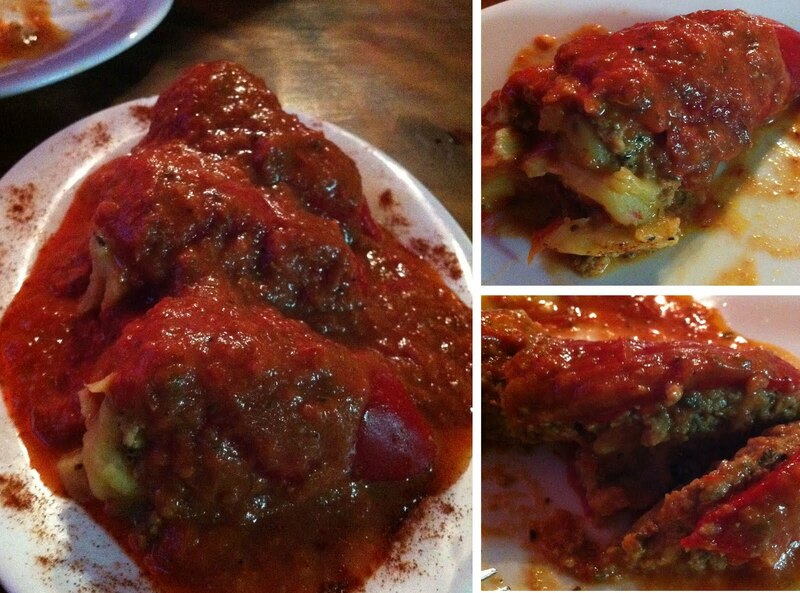 The dish consists of three stuffed bell peppers covered in a tomato sauce. On the inside was a cheesy mixture of beef that sort of had a baby food kind of consistency. It was thick and sticky but the cheesiness was quite nice.